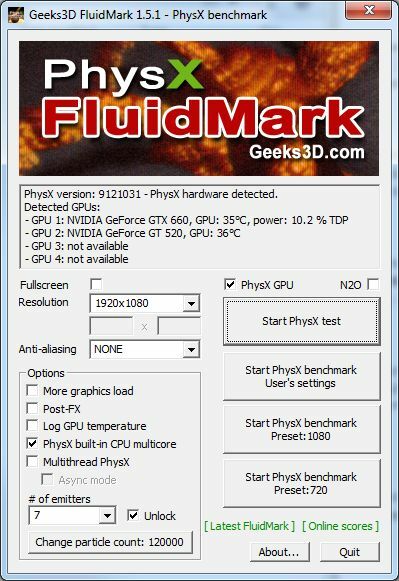 No new feature for FluidMark, it’s still based on PhysX 2.8.4 (I will start very shortly the dev of new tests/benchmarks with PhysX 3.x, just few things to finish before). FluidMark 1.5.1 is a maintenance release and comes with ZoomGPU 1.8.12 that supports latest NVIDIA GPUs (GTX Titan as well as some notebook GPUs like GTX 600M series, GT 600M series). And for command line lovers, two new parameters have been added to launch FluidMark with Preset:1080 or Preset:720 (scores can be stored in a CSV file). Bugfix: in some situations, the score box was not displayed at the end of the benchmark. Change: GPU monitoring code updated with ZoomGPU 1.8.13. New: added two command line params: /preset_1080 and /preset_720. New: added NVIDIA GeForce GTX Titan as well as several mobile GPUs: GTX 6xxM, GT 6xxM, GT 5xxM. Change: GPU monitoring code updated with ZoomGPU 1.8.12.